When I started out on my self-appointed task to make homemade versions of some popular Girl Scout cookies, I didn’t have any problem picking out Do-Si-Dos, Samoas and Tagalongs as my top choices. But I thought it might be fun to throw in a recipe that used Girl Scout cookies, too, and this is that recipe. 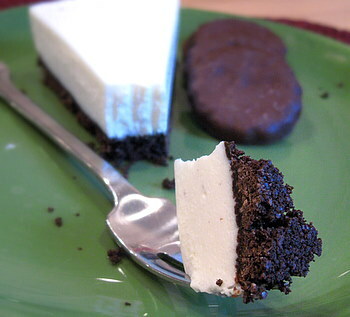 I opted to use the ever-popular Thin Mints – crispy, chocolate dipped mint chocolate wafers – as a crumb crust to compliment a vanilla cheesecake. Because the cookies are chocolate-covered, the idea of an unbaked crust appealed to me as it guaranteed that I wouldn’t end up with chocolate running all over the floor of my oven. No-bake cheesecakes, however, have never been a favorite of mine because there seem to be so many ways to screw them up. They should be easy to make because you don’t need to worry about over cooking or fussing with a water bath, as you do with some baked cheesecakes, but I’ve had too many that are extremely fluffy (Cool Whip/marshmallow-type consistency) or far too dense (straight cream cheese, perhaps cut with a little lemon zest). This in mind, I decided to see if I could find a nice middle ground that would taste like a nice, creamy cheesecake while still showcasing my mint chocolate crust. I used a mixture of cream cheese and whipping cream as the base for the cheesecake – the cheese for flavor and texture and the cream for lightness. Held together with a bit of gelatine (or gelatin, if you prefer), the cake turned out beautifully: easy to make and satisfying to eat. It is light and creamy, yet not “airy” at all. It’s quite a bit lighter than most baked cheesecakes, though in this case it really seems to let the mint chocolate flavor of the crust stand out. In fact, the whole dessert reminds me a little bit of mint chocolate chip ice cream, flavor-wise. Now, if you don’t have a box of Girl Scout Thin Mints or you don’t want to make them yourself, Keebler makes a cookie called Grasshoppers that are identical to Thin Mints. Same texture, same shape, same nutritional stats, same taste – and they’re usually really inexpensive when they’re on sale. Lightly butter the sides, but not the bottom, of a 9-inch springform pan. In a food processor, whiz together Thin mints and butter until mixture is coarse crumbs. Press cookie crumbs into the bottom of the prepared pan. Refrigerate crust for 20-30 minutes. In the food processor (wipe out excess crumbs, but there is no need to clean it) whiz together softened cream cheese, sugar and vanilla extract until creamy, scraping the sides of the mixing bowl with a spatula to ensure even consistency. In a small microwave-safe bowl, whisk together hot water and gelatine. If gelatine is not fully dissolved, microwave the mixture in 30-45 second intervals, whisking until gelatin is entirely suspended. Turn on the food processor and with the motor running, slowly pour the gelatin mixture into the cream cheese mixture. Keep the motor running and stream in the whipping cream, continuing to process until filling is light and smooth. *A box of Thin Mints should have 36 cookies in it. I used 32 cookies for my crust. While you can certainly incorporate all of them, feel free to save a few to snack on or to garnish your plates with. The crust is reasonably thick and 4-8 cookies reserved should not make a huge impact on the final product. I have a recipe for mini-cheesecakes in muffin tins/papers. And while it is a baked recipe, I was reminded of it because it uses Nilla wafers for the crusts. You could probably do something similar with this recipe, just drop a thin mint into the muffin paper, top with the cheesecake batter and chill. Just my uber-lazy thinking on the recipe. 🙂 But it sounds delicious! This really sounds delicious! It’s a new and refreshing way to use those Girl Scout cookies. As a Thin Mint addict, I gotta tell you this looks AMAZING! 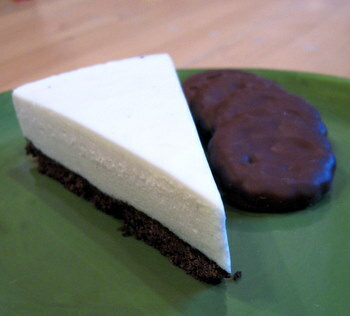 I’m absolutely putting in an order for Thin Mints so I can make this! Jeez – this is so perfect! I might make this for a Super Bowl dessert! I don’t know how I missed so many posts Nicole. So many delicious recipes…so little time! Just wondering – how long did you process the cream cheese mixture? Mine was definitely smooth, but had at most half the volume. Maybe you ran longer and it whipped more air into the mix? (saying many many many bad words…) I’m thinking that the lack of volume may have to do with the cup of heavy cream I forgot to put in. Doh! I just made this, and it was amazing. Your description is perfect: you donâ€™t need to worry about over cooking or fussing with a water bath… Iâ€™ve had too many that are extremely fluffy (Cool Whip/marshmallow-type consistency) or far too dense (straight cream cheese, perhaps cut with a little lemon zest). The mint was showcased well, without being overly minty. I’ve been trying to keep my oven off because it is really hot here, and this recipe was just the thing. Refreshing, light (but with that “middle ground” consistency!) and nicely minty. I found that refrigerated for 4 hours the filling set, but the cookies crust crumbled. Refrigerated overnight and the crust held together much better. I think I will have to try this recipe with a little lemon zest or curd, maybe vanilla cookie crust? I am such a fan of this recipe, I will make it again this weekend for company! Thank you! thks for this great recipe, I made it as a bon voyage cake for my colleague. Everything was swell but it seems that the filling was still rather soft, even after leaving it in the fridge overnight. I was very careful with the recipe, what went amiss, you think? The texture was lovely, just the right combination of cream cheese and whipping cream. I live in a very warm country and it still held together really well. Thank you! I made this today (first time I have made a no bake cheesecake) and it looks fab, but we don’t eat it till tomorrow. Shall post review after tasting tomorrow, but it looks divine! BTW, we don’t get “thin mints” here in Australia (I don’t think?) but I used choc covered digestive cookies instead – do you think you could use something like Oreos? 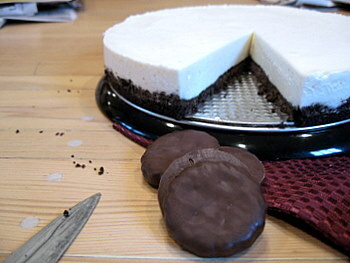 This will be much less stressful to make then regular cheesecake will make for Easter this year. I made it as a bon voyage cake for my colleague. Everything was swell but it seems that the filling was still rather soft, even after leaving it in the fridge overnight. hello, came across your blog recently and i love it! Karen – Yes, but make sure that your ingredients are all at room temperature and beat the cream cheese very well to make sure it is not lumpy. Can you believe Iâ€™ve never made brown butter anything?! Iâ€™ve got to check this off my list and these cookies seem to be the perfect excuse 😉 Weâ€™ll try it with my daughter, Iâ€™m sure sheâ€™ll enjoy doing this especially for our blueberry muffin together with this lovely cookies Thank you!